Does my screen display images accurately? Computer monitors and mobile/tablet screens do their best to reproduce colors and brightness correctly, but each one is different. In fact, a screen even reproduces photos differently when it starts up compared to the way colors and brightnesses look after the monitor has been running for a while. This is a serious problem when viewing photographs on the computer, mobile or tablet. Photographers are careful to adjust the photographs properly, so they print perfectly, but other users will not view these nuanced adjustments at all on their own screens, and in fact may view the photograph totally wrong (overly bright, too contrasty, or oversaturated/unsaturated). There is no way a user will see the image as the photograph will print, unless their own monitor has been professionally calibrated with a special calibrating device (this of course is very uncommon unless you are a professional photographer yourselves). Therefore, what you see on your screen is really not what you will see once you receive the prints for your photographs! Why do hi-resolution images display differently from standard-resolution images? Once you have downloaded your images on your computer, you may have noticed that images from your high-resolution album display differently from the ones in the standard-resolution folder. Note that this applies for when you download and view them on your computer (on your online gallery they should display the same). This is because of the fact that they have different colour-profiles. High-resolution images have AdobeRGB as their colour profile, so that they contain more colour information, which makes them better for printing at high-end printers. AdobeRGB allows for more vibrant colors in your prints, with better color consistency that your own monitor cannot even replicate. Standard-resolution images, on the other hand, are sRGB, which is better suited for displaying on the web, but contain less colour information. Unfortunately many computers do not have native support for AdobeRGB, meaning that AdobeRGB images will appear (sometimes dramatically) different than images with the sRGB profile. 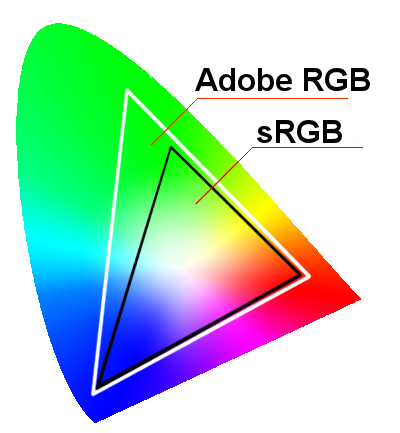 The diagram below shows the greater colour gamut of AdobeRGB compared to sRGB. Adobe RGB 1998 occupies roughly 40% more volume than sRGB. Can we have the raw (unprocessed) images? Photographers’ jargon: When photographers talk about “raw” images, they normally refer to the files that a professional camera produces. These are not normal .jpg image files, but have a proprietary extension (e.g. .NEF, for nikon cameras) and are unreadable by most computers unless they have specialised software installed. Raw files are extremely large (sometimes exceeding 50Mb), lack contrast and vibrance, and need to be colour-graded and processed in order to become suitable for viewing and printing. “Straight Out Of Camera:” When clients refer to “raw” images, they might either refer to the raw files above, or the unprocessed images in whichever file format. Such unprocessed images are also referred to as “Straight Out Of Camera” images. Can we have raw images (whether as RAW files, or unprocessed jpg files)? We do not give raw images. We are extremely proud about our product, and cannot deliver anything that has not been processed (colour-graded, retouched for blemishes, etc). As an analogy, if raw images are like raw chicken, then processed images are the cooked dish – seasoned, marinated, and plated to perfection – and to take the analogy one step further, a chef would never plate raw chicken, nor hand a bag of the raw materials leftover from the cooking process. Please let us know what you are looking for, and we would be delighted to look for it and process it for you, granted that it meets the technical standards for processing. Kindly note that specifically for portrait sessions (such as newborn, maternity, or children) there is a charge per extra edited portrait, while for christenings, there may be a fee depending whether you require a large number of extra edited images. Please hover over the images (or tap if you are on a mobile device) to see the difference between the Straight Out Of Camera raw and the final image. Beyond the obvious colour-grading, the skin has been smoothed, and blemishes removed. You can see more retouching samples here. I installed my mobile app but the images do not show now. Since our gallery mobile apps are “web apps”. This means they are connected to your phone’s browser, and if for any reason the browser’s history is cleared, so are the images in your mobile gallery app. All you need to do is reopen the mobile app when you are connected to the internet and this will reload the images again, and make them available for offline viewing. I am having difficulty installing my mobile app. Please help me! Sure! We have created a help page just for this! See it here! Which email address should I use to login? You can use any email address to login. Just make sure it is a valid (real) email, and that you have access to it. As long as you enter the password we gave you, our system does not care what email address you are using. I do not have the password to my private gallery. What can I do? If you have lost your password, please do not hesitate to give us a call or send us an email. Note that we can only give the password to the owner of the event/photo shoot. If you are a friend or relative of the owner, please ask the owner to give you the password. When should I expect to receive my password? We will send you an email with the password as soon as your photos are ready for viewing. Make sure you check your spam folder in case our email ended up there. I am not the owner or this event/photo shoot, but I would like to see the photos! For privacy reasons, we can only give the password to the owner of the event/photo shoot. If you are a friend or relative of the owner, please ask the owner to give you the password.